One thousand doctors have appealed directly to the prime minister to allow a £1.1bn refurbishment of two London hospitals to go ahead. In an open letter published in The Times, the doctors pleaded for the modernisation of the Royal London and Barts in east London to be approved. It said allowing the scheme to collapse would be a "cruel injustice". 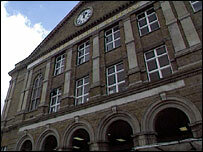 Health Secretary Patricia Hewitt said a review will be conducted to make sure east Londoners are properly served. In a statement, she stressed there are no plans to close Barts and said the government is looking closely at proposals to expand the cardiac and cancer services. "Given the scale of the proposals, the large sums of taxpayers' cash involved and the significant reduction in waiting lists in recent years, it would be reckless to go ahead without proper scrutiny," she said. The signatories of the letter said the prime minister gave a personal commitment to the redevelopment in 1998, reversing years of indecision over the fate of the two hospitals. Both hospitals serve "some of the most ethnically diverse and deprived (people) in the country" who deserved the state-of-the-art facilities the project would provide, the letter said. Duncan Dymond, a consultant cardiologist, said it was "disgraceful that the scheme should be threatened by ministers at this late stage". "Promises were made to east London's population and if these are broken then vulnerable people's health will be seriously damaged in the future," he said. The doctors, including 450 consultants and professors, said the decision to review the provision of cancer and cardiac services would seriously affect trauma and emergency care facilities. "The loss of any of these services would be damaging to the health of this vulnerable population and irretrievably damage our medical school," they said. The doctors highlighted the vital work done at both hospitals in treating more than 200 victims of the London bombings. "Without these hospitals, London's ability to cope with another serious terrorist incident must be in doubt," they said. Suggestions that there could be over-capacity in the provision of heart and cancer care in the area were also dismissed. They pointed out that Deputy Prime Minister John Prescott's plans to develop the Thames Gateway area will increase the population relying on the hospitals.